Undefeated German heavy Edmund Gerber, 22-0, will again face British veteran Michael Sprott, 36-19, December 15 in Nueremberg on the undercard to Abraham vs Bouadla. Gerber (pictured) stopped Sprott in four their first time out in September in Bamberg but appeared to have problems with his tricky opponent and was also cut in a bad place. However, Sprott left himself open and Gerber nailed him with a good right and Michael went down on his back. He looked gone but got up, took a count, raised his hands ... and then the fight was waved over. Sprott protested and even pushed referee Gerard Sigl and got a 90 day suspension. Gerber have since beaten Darnell Wilson on points but was badly shaken in the first and Sprott can depending how much it want it still test almost anyone. Former IBO jr middle champ Attila "the Viper" Kovacs, 29-4, headline a Felix-Promotion show in Szentes, Hungary, on Sunday, December 2. Opponent is still to be announced after some last minute changes. In the co-feature cruiser Sandor Nagy will look for win number seven. There´s also a special guest from Sweden: lightheavy Oscar "Golden Boy" Ahlin, 5-0 (5). It´s early days yet and Ahlin have yet to answer some questions on but this far he´s shows great promise and have that special charisma to go with a good punch, fast hands and a colorful style. There´s no opponents announced for either Nagy nor Ahlin. EuroEvent in Denmark stage a Christmas show in Aalborg Dec 15 headlined by jr welters Kim Poulsen and Kasper Bruun. Bruun, 15-0-1, square off against Belgian Tarik Madni, 17-4-1 while Poulsen, 21-1, face Croatian Veljko Saponja, record unknown. Heavyweight Claus Bertino, 13-4, is also on the bill along with 2-0 newcomers Abdul Khattab and Stephan Alms. EBU jr light champ Devis Boschiero, 32-1-1, will make a voluntary defence of the title in March of 2013 against an opponent to be announced. Boschiero´s sole loss came against then WBC champ Takahiro Ao and Devis lost a close, disputed decision late last year but bounced this summer by winning the EBU title and have since defended it once. 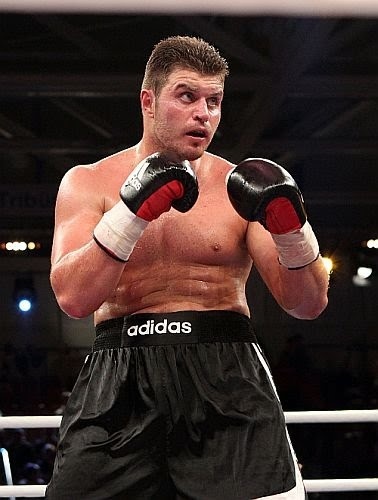 Lightweight Krzysztof Cieslak, 18-3, headline Babilon Promotion´s show in Wolomin, Poland, December 2. Cieslak face Nicaraguan Miguel Aguilar, who is a good candidate for weightwatcher of the year as he´s fought from superfly to jr welter just months apart in 2012. Cieslak have lost to Felix Lora twice and Dariusz Snarski and Babilon´s matchmaker Robert Krzak makes no fuss about where the problem is: -Krzysztof needs to get in shape or retire! Babilon returns December 9 in Bialobrzegi with a show headlined by lightheavy Pawel Glazewski, 18-1 - with the sole loss to Roy Jones Jr.
Belgian veteran Jackson Osei Bonsu, 43-5-1, move up to middle and face Pole Damian Jonak, 34-0-1, in Katowice, Poland, December 8. Osei Bonsu, a former EBU welter champ, holds the EU title at jr middle and is looking to defend the title in February against Spaniard Ivan Sanchez. Jonak, formerly with Sauerland and Bullit Knockout and now back with Knockout, have been around for some time now but despite his glossy record he has no big names on his record. Heavy Carlos Takam, 26-1, returns to action after a brief layoff December 14 in Cergy-Pontois, France. Takam face Croatian spoiler Ivica Perkovic in a rather undemanding matchup. Takam stopped Francois Botha earlier in the year and also holds a win over Gbenga Oloukun while the sole loss came to Gregory Tony. Headlining the bill in Cergy-Pontois is French fly champ Hassan Azaouagh, 13-6, who defends the title against Thomas Masson, 8-3-1. Idrissi won the BBU female flyweight title on scores of 59-54 twice and 60-53. Juhane was down in the first but got up and put up a good fight even rocking the Dane in the fifth with a big right. 40-36 twice and 38-38. Mahdanau showed guts and experience from martial arts but was outworked by Carlsen. Makar looked allright in the first but flopped over quite easily twice in the second and it was stopped. 10-9 on all cards but Makar did ok and have apparently been to a gym a few times. 40-36 on all cards. Hurbo was green, out of shape and ready to go at any time but Grötner just couldn´t finish him. Pugachou was green, out of shape and ready to go at any time and was rescued in the third. The second was scored 10-8 on two cards. Novikov won the WBC Silver 147 lb title on scores of 120-108, 120-107 and 120-109 dominating the action in a no knockdown affair. 98-90 twice and 97-91, for vacant WBC Baltic. Nabiyev was badly cut after accidental headclashes and it was stopped and went to the scorcards: 89-83 twice and 89-82. The vacant WBC CISBB and Baltic titles were at stake. Rebrasse won the vacant EU supermiddle title by stopping Di Luisa. 50-45 twice and 49-46. Ignoring amateurs in WBS is one thing but how do we deal with pros turning semipros?? vacant BBU lightweight title, second stoppage loss in a week for Hramyka.